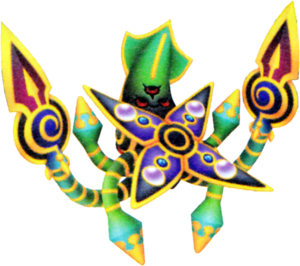 The Brawlamari is a Dream Eater that appears in Kingdom Hearts 3D: Dream Drop Distance. It serves as a boss during Sora's Dive to The Grid and Riku's Dive to the Country of the Musketeers. The Brawlamari's name is a portmanteau of "brawl" and "calamari". Ika (いか?) is the Japanese word for squid. 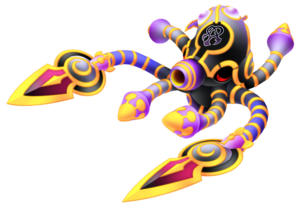 The version Sora encounters resembles an octopus, while the Brawlamari that Riku fights resembles a squid. Laser grenade: It launches multiple bombs that cause damage in contact. Usually all in the same direction, which makes it easier to dodge. Barrier: It greats a type of offensive barrier and closes in the player. One could slow down the speed to avoid coming to contact with it, or even use Reflect on the borders, though the first method is safer. Missing the attack or not, the Brawlamari creates an opening, and Sora will be able to reach his weak spot, the flashing dots on its head. When destroying one of them, it regains consciousness and retreats for more attacks. Repeat the process. Note: The Laser attacks are usually performed after the first attack Sora makes. Getting "Gold Diver" involves destroying one spot per attempt, since it will retreat after one dot is gone. So at each try, you must focus on destroying one spot before it regains consciousness, using the first two attempts to kill it. Also, speeding up after defeating Brawlamari does help on getting to the Finish Line sooner, which multiplies your score even more depending on how fast you got there. Don't speed too much, however, or you won't get the stars. Riku's battle, on the other hand, occurs later on in the game, allowing a harder fight to take place. It starts off just like Sora's battle, but the player will soon realize his attacks have improved. Only one attack is new to this boss, but all of his other moves will have new remarks. Blade: at the beginning of the battle, this attack will have an improved version of the first one. After making an attempt to hit Riku, Brawlamari will keep these tentacles in place, and then try a new slash. Rock throw: It will get faster as whole, since the rock goes to him faster, but it's also thrown faster. There must be timing for the evasive move, and there must be caution when choosing the direction you evade to. At first it will only have these attacks. It will only make one attack, then move to the Barrier attack (above), that the only change is that's faster, but very little, so the move is the same. Once both flashing dots are destroyed, it will seem defeated, but it will change into its second form. It also reveals it's new weak spots for a second, when it opens it's mouth-like area. Cannon: It will charge up energy, so you know this will be devastating. Luckily, some rocks will gather around the center (which can be confused to the ones he usually throws at you), and you can hide behind them during the whole thing. It's the only way to avoid it, since it covers the whole area, and if you're caught in it twice, you're most likely to be defeated. There's quite some time to get behind the rocks, but don't get too comfortable. Again, he will show his weak spot, and like before, it doesn't matter if you're hit by his attack or not, you'll be able to see all his four weak spots. Unlike before, however, he won't hide away after having one flashing dot eliminated, which allows you to use all the time you need. Blade: It will try to hit you three times, pulling his tentacles back and forth after each attempt. At the last one, it will seem he's stopped, but it will try to slice you (like before). So you have to watch out and remember his tactic. Lasers: It will use four simultaneously, a lot more faster, more randomly 9creating small circles), though he will use them all to follow you. Cannon: The attack does not change, but it gets harder as each weak spot is destroyed. It seems his attack gets stronger, what forces the rocks to start moving during the attack, and if one is not careful, they will drift away, and receive damage. With two killed, they move away really slowly (which is good because you can easily keep up, but bad because sometimes you don't even notice they're moving), and when three are destroyed, the rocks will move away quickly. He will stop performing the Rock Throw attack in the second phase, and doesn't use the Laser Grenade at all in this fight. It's a good idea to defeat the weak spots all at the same time. Since there's no need to defeat one per try, and it gets harder as you defeat each of them, it's better to try and destroy them as close to each other as possible. This page was last edited on 12 February 2019, at 13:29.